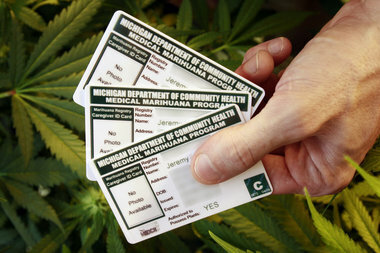 In The Case of People v Kiel the Michigan Court of Appeals ruled on July 17, 2012 that a Michigan Medical Marihuana Registry Identification Card Is prima facie evidence of the first and third elements of the section 8 affirmative defense. The Michigan Medical Marihuana Act has two distinct levels of protection for defendants to utilize. Section 4 provides for broad immunity from arrest and prosecution but only if many requirements are met. Section 8 provides for an affirmative defense, which means a defendant can still be arrested and prosecuted, but is entitled to dismissal of the charges if 3 elements are proven. 1. A physician’s recommendation that in the physician’s professional opinion and in the course of a bon fide physician patient relationship, the patient is likely to receive therapeutic or palliative benefit from the medical use of marijuana. 2. The defendant was in possession of an amount of marijuana that was less than reasonably necessary for the purpose of treatment of the patient’s medical condition. 3. The patient’s use of medical marijuana was only to treat and alleviate the patient’s serious or debilitating medical condition or symptoms associated with that condition. The Court in People v Kiel reasoned that in granting a registry identification card (Medical Marijuana Card) the State Department of Licensing and Regulatory Affairs (LARA) was in effect certifying the first and third elements of the Section 8 affirmative defense. Thus, a person who has their medical marihuana card but fails to meet all of the requirements for the immunity of section 4 may still assert the section 8 affirmative defense and only have to provide evidence as to the second element in order to either gain dismissal of the charges or to have the defense presented to the jury. At Rudoi Law we understand how to use all the current case law to your advantage when defending you in a medical marijuana related case. On July 31st, 2012 the Michigan Court of Appeals in John Ter Beek v City of Wyoming ruled that zoning ordinances which conflict with the Michigan Medical Marihuana Act are void and unenforceable. The City of Wyoming amended its city code and enacted a zoning ordinance which provides: “[u]ses not expressly permitted under this article are prohibited in all districts. Uses that are contrary to federal law, state law, or local ordinance are prohibited.” The City of Wyoming admits that the purpose of the ordinance “is to regulate the growth, cultivation and distribution of medical marihuana in the City of Wyoming by reference to the federal prohibitions regarding manufacturing and distribution of marijuana.” Basically, the City of Wyoming was attempting to penalize all medical marihuana growth, manufacture, distribution, and use by saying that you may not violate federal law in the city. However, John Ter Beek decided to sue the City of Wyoming under the belief that that ordinance should be voided, due to its conflict with the Michigan Medical Marihuana Act. The controlling precedent is that any ordinance that purports to prohibit what a state statute permits is void. Therefore, the Michigan Court of Appeals ruled that The City of Wyoming ordinance was attempting to prohibit what the Michigan Medical Marihuana Act permits and is thus void and unenforceable. This leads to the conclusion that all city ordinances across the state that attempt to prohibit anything that the Michigan Medical Marihuana Act permits are void as well. The City of Wyoming also argued that the Michigan Medical Marihuana Act is what should be void because it directly conflicts with the Federal Controlled Substances Act. There is the Supremacy Clause in the U.S. Constitution that basically states that any state law that is in direct conflict with a federal law is void. However, the Michigan Court of Appeals rejected this argument by looking at the intentions of congress when enacting the Controlled Substances Act. The Medical Use permitted by the Michigan Medical Marihuana Act is not mandatory, and it is thus not impossible to comply with both the Michigan Medical Marihuana Act and the Federal Controlled Substances Act. Therefore, the Michigan Medical Marihuana Act and the Federal Controlled Substances Act are not in direct conflict and the MMMA is thus not preempted by the federal CSA. All uses of marijuana are still illegal under the Federal Controlled Substances Act. However, the Federal government cannot force the states to enforce federal law. Remember, the federal authorities can still arrest and prosecute medical marihuana users in federal court. However, in the State of Michigan any city ordinance which purports to prohibit any use of medical marihuana that is permitted by the MMMA is unenforceable. At Rudoi Law we understand all of the case precedent regarding Medical Marijuana, and are fully prepared to help any citizen that is wrongly penalized for their proper medical marihuana use.